Award winning custom residential and light commercial. Each project is approached with an eco-friendly, site-specific, creative approach. Each budget sparks a design opportunity. We wish to provide beautiful shapes and details for daily consideration in every project. The clients' "wish list" is recorded and used as the point of departure for a set of design of construction documents. We value listening skills highly. Founder and partner Chad Faucheux, along with Founder and Partner Curtis Raymond Jr., have 30 years of combined experience in the realm of high end residential design. The newest partner to the firm, Milosav Cekic, brings a vast knowledge of expirence throughout the design world. 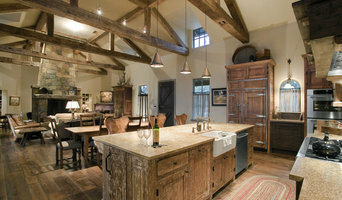 Design Visions is one of Austin’s and Fredericksburg's premier high end residential firms. We design all different styles of homes from traditional to modern. Whatever your needs are, we can fulfill them. We have two locations to serve you, Austin (512) 583-0059 Fredericksburg (830) 992-3640 In our quest to create a new and better design firm we have learned to put every client first. The homes that we create are not about the designer but about the family’s lifestyle and their day to day use of the home. Being a smaller firm allows us to be personally involved with each project from start to finish. Communicating with both the home owner and the builder on a continuous basis as well as taking trips to the site helps make the process go much smoother. Tom Hurt Contemporary Architecture is an award-winning architectural practice in Austin, Texas, headed by principal, Tom Hurt AIA. The office's built work is known for its thoughtfully detailed and dynamic forms and spaces as well as sensitive relationships to its site. Tom Hurt Architecture designs highly sustainable buildings -- limiting building size by paying careful attention to clients’ needs and by reusing and readapting buildings and building materials where possible. The office is known for its use of exceptional, natural day-lighting, sustainable building design, and its use of familiar, cost-appropriate building materials and construction techniques to create exciting, warm, and unique spaces and projects. 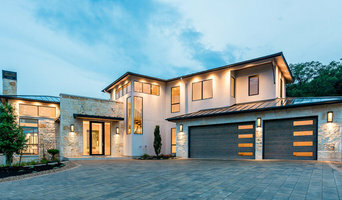 An Austin, Texas and Big Sky, Montana based design firm, Andrew Wagner Architects has designed luxury residences at a number of private resort destinations in different parts of the country. The firm pays special attention to beauty, functionality, high performance design, meticulous detailing and to you, the customer. The home is where your heart is. A custom home is an expression of you, your families’ values and lifestyle. Our firm applies our knowledge and design expertise to help create your own personalized dream. Our firm is qualified to deliver a high performance design, creating a home that is healthier, more safe, comfortable, durable and energy efficient. Welcome home. MF Architecture is an award-winning, licensed architecture firm that welcomes residential and commercial projects, both small and large. Office of Architecture, based in Wimberley, Texas, is an award-winning, design-oriented firm with over thirty years of experience. Providing creative solutions to both residential and commercial clients, the designs of the Office of Architecture are grounded in proven design principles resulting in architecture that is clear and precise, conceptually simple but exciting, and appropriately contextual without being derivative. Guided by the architectural principles of form, light, proportion, and sustainability, ooA is committed to being of service to their clients, helping them realize the maximum potential of their project while creating solutions that are as unique and individualized as their clients and their needs. Through working with their clients to clarify project goals, they search for the best program based response, not necessarily the most obvious or expected one. Continually engaging their clients throughout the process, that response is carefully analyzed, challenged, and refined, rendering it into architecture that not only meets programmatic requirements but inspires, nurtures, and celebrates the user and observer as well. Neel, a graduate of UT Austin and Principal of ooA, became a registered architect in 1985 and opened his first office in 1986. With more than thirty years of experience, Neel has successfully designed and managed the construction of a large variety of projects including office buildings, recreational facilities, restaurants, churches, medical facilities, private residences, and multi-family developments including a co-housing project in Arizona. While employed by a real estate development firm, Neel spent seven years focused in the construction industry, being in charge of construction activities for custom single family residences, cluster homes, and townhouses. A long time interest in sustainable design led Neel to exploring such alternative building materials as adobe, rammed earth, straw bale, structural insulated panels, and more recently, insulated concrete forms (ICFs). Heron Signature Living, Inc. specializes in building custom luxury homes in Webb, Bexar and Travis counties. We are a full service architecture and interior design firm whose work covers a wide range of project types from master planning and site feasibility studies to custom single-family homes. HGTV DESIGN PRO - SEE OUR WEBSITE FOR LINK or copy and paste: people.hgtv.com/professionals/barron-custom-design "Best of houzz" WINNER for Design- see badge below AIA Associate and CPBD designation 20+ years of architectural building design experience Felicia is a third generation Austinite and her experience at a well known Architectural firm as a Project Manager for a National Home Builder and as Director of Design Development for a local Home Builder have given Felicia a proven track record of success. She established Barron Custom Design in 2003. Felicia also cares about the community she calls home. She has donated her design skills and time to the Mobile Loaves and Fishes "Community First" project, a nationally recognized program for housing the homeless. Felicia has also donated time and talents to Casas for CASA, Habitat for Humanity and Doug’s House, a local AIDS Hospice. A small firm headquartered in Lago Vista, TX specializing in single-family "Texas Contemporary" residential building design with rigorous standards for modern design, no matter how large or small the project. Local knowledge, creativity and an ability to work openly and collaboratively produce our results. We have our own approach to design; a unique signature style, if you will, and a preferred method of operation. Good design looks great, yes — but why shouldn't it also feel great, smell great and sound great? We pride ourselves on our belief of 5-sense design, giving our clients a unique multi-sensory experience. We enthusiastically take on the challenges presented by each distinct project to inspire highly creative, cost-effective solutions meant to enhance building performance and daily life as a whole. Pavonetti Architecture began in 2013 as a small, boutique architecture practice in Austin. We believe the design process must be rigorous, relentless, and inclusive of architect and owner. Created in 1983, Infinity Design, Inc. has been providing design services to builders and clients throughout Central Texas. From designing entire subdivisions to working with clients on their custom house, we can shape and mold your ideas and make your dreams come to life. Our goal is to work with you in making your house a home; your dream a reality! We brew our Architecture with passion -- embodying a dialogue between people and place. Our studio wants to listen to your story and answer your questions. Let's build something together. Pavonetti Architecture began in 2013 as a small, boutique architecture practice in Austin, TX. We believe that the success of any architecture is strongly dependent on the relationship between the client and the architect. The site of the proposed building and all of its physical characteristics must be considered thoroughly and the design process must be rigorous, relentless, and inclusive of architect and owner. We have 50 years of experience in achieving exceptional results. Our continued tradition is providing everyone with outstanding design no matter the budget or what level of service is required. We feel very fortunate to regard architecture as our passion, a passion grounded in a functional reality. Architecture is the very unique practice lying between the arts and engineering, the creative alongside the scientific. To put it simply, we see ourselves as assembling a puzzle, taking the distinctive fragments of a new project and unifying them into a successful design. Collaboration is the key to the design's success. The client's needs, desires, and ideas are welcome and necessary to the creative iteration process. We feel that a project's context is far more than the site location and surroundings, and actually encompasses the users as well. We feel that clients will benefit from our years of experience and world travels. Each project completed is a learning experience that accumulates for the benefit of the next. We truly enjoy the design process and the variety each project brings. We are extremely open-minded and believe in creating designs that are both stimulating for the client as well as for ourselves as we work. Our task is to do the best job possible under the unique conditions of each project. Winners of over 30 design awards for our residential work, we have also been singled out on home tours and in over 300 magazine and newspaper articles for our sensitive, understated houses. Don Harris began his Austin practice in 2000, after beginning his career in the architecture firms of Portland and San Francisco. He brought with him a respect for historical architecture as well as a leaning toward modern design. Because of Don’s small practice, his clients have easy access to him throughout the design and build process. Don is foremost a good listener which translates to his ability to create designs that reflect his clients’ needs, dreams and budget within the confines of the building site. His easy manner helps him work well with builders, designers and other trades in the process. His clients end up with functional, efficient, beautiful homes that were created within the general budget they had set. 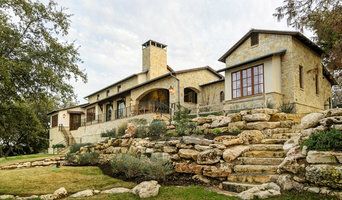 Award winning Hill country architecture firm focused on high design & production of unique, craft oriented residential projects for challenging sites requiring sensitive, innovative design solutions. m(odm) strives to balance one’s seemingly chaotic environment with the calculated rules of proportion and function. “that equilibrium between clean line and chaos” We welcome client relationships and dialogue during all phases of development, for a true collaboration between owner and studio. With the belief that every project generates its own set of specifics, our approach is free of preconceived ideas, with every response a thoughtful reference to client and site. The studio pursues likeminded clientele who are willing to place a value on exploration. We continuously seek a balanced consideration of the client’s needs, materials, site amenities, kinetics of environment, social consciousness, and budget requirements. Through the assemblage of form, space, material, and light we hope to leave our clientele with an unexpected representation of themselves that excites the senses for years to come. Thank you for visiting. Committed to creating a collaborative process and site-specific designs, we strive to create homes that embody three beliefs: a simple approach, practical planning, and beauty. 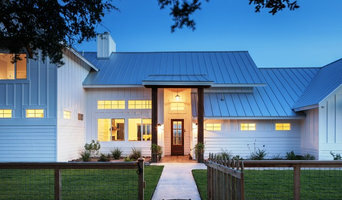 Richard Mersiovsky, residential architecture is a firm with over 15 years experience, devoted to excellence in the design of new single family homes and remodels in the greater Austin area. These range in style from "Old world" and "Tuscan" to more contemporary "Hill Country Modern". I create one of a kind homes that are a reflection of the client's tastes and personality. I would love to talk with you, call for your initial consultation. There are so many ways to say "home". No matter how you spell it, Roeder Design desires to help you realize your own unique dream. Where you live has a profound influence on your life. Winston Churchill said, "We shape our buildings; thereafter, our buildings shape us." We pride ourselves in listening to the client and delivering an artful, efficient, and earth-friendly project.